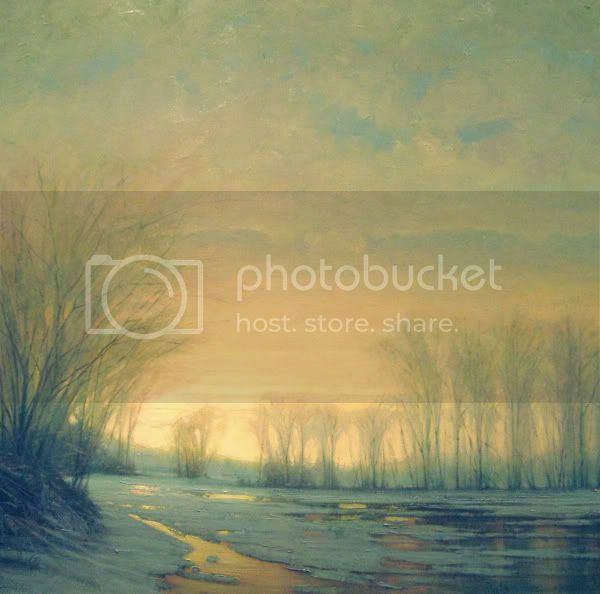 Winter Poems: 'River-dawn', by jan-u-wine, with 'Winter River' by Martin Poole. The second of jan-u-wine's winter poems is newly written, inspired by the painting below. This time, we look through the eyes of an older Frodo, a Frodo who has been through much, yet still is trying to take in his parents' deaths. Again jan-u-wine does her magic, choosing just this and that word, this and that remembered image, to make a poem that takes us inside Frodo's lingering mix of thoughts and feelings. Its pace is like the winter river's, pensive, grave, stilling here and there while memories glance up from its ice-mirrored depths. But the rhythm keeps pulsing along, quiet and deep, like the water in the winter river. The picture used for this post, found by chance browsing for winter river scenes, was painted by Martin A. Poole. I found more of his work on line, mostly landscapes, which were beautiful and atmospheric like this one, 'Winter River'. I found almost no biographical information about him, only that he is American-educated (graduated SUNY-Bufflao 1979) and that his work is being shown and sold from galleries. Hopefully, he is alive and well and still painting. I remember the dawn, that day. before the Sun's swift rise. At the last, I turned from her. and the birthing of the day. jan-u-wine's "A Winter's Day", plus paintings by Frits Thaulow and Anders Andersen-Lundby. that was very moving, in a quiet and gentle way. I love how nature plays such a strong part in this poem, as in all of Jan-u-wine's poems. It's part of what makes them, for me, so true to Tolkien's subcreation. Thank you fo rthis lovely post! I love how nature plays such a strong part in this poem, as in all of Jan-u-wine's poems. It's part of what makes them, for me, so true to Tolkien's subcreation. You know, Eandme, that is well-observed. I don't think it's ever been explicit for me before. Thank you. Lovely poem, but for some reason, I don't see the picture! IS there a link to it? What a beautiful comment, Mews. If your heart was touched, mine is touched reading what you wrote. Suddenly I had an image of you standing there beside Frodo, unnoticed, sharing his vigil. "Look", I imagine you telling him, breaking the silence, "the sun is rising". No drama, just quiet, matter-of-fact. But what you say makes all the difference. This struck me on several levels. I felt heartbroken for Frodo and his loss, yet his sensibility to the beauty of his surroundings, even when the season is harsh, can't be denied, despite being steeped in sadness. The Water-witch made me think of the Watcher in the Water must have been. The threat of being dragged down to a watery grave would have held an especially resonant terror for Frodo. But as the poem continued I began to be afraid that Frodo was beguilled by the river and was contemplating reuniting with his parents. He seems transfixed and somehow being tested through his long vigil. I was relieved when he could turn away and face the approaching dawn. This also reminded me of 'Piper at the Gates of Dawn' in The Wind in the Willows', something else I can never read without crying. Thank you for another very beautiful poem and the picture with its wonderful Turner-esque light, is perfect to go with it. Good gracious, another comment full of insight, Aliensouldream. Thank you for taking the time to write down your thoughts. I hadn't thought of the resonance with the Watcher. But, yes, the Watcher is another lethal water-dweller, bent on taking Frodo. The poem does bring out the sense of the river as the locus of death, or its threat, or, as you point out, even its allure. Rivers in myths are often places where mortals confront or succumb to death - whether to cross over into Hades or be pulled up sputtering to new life, like Sam from the Anduin. I also noted with pleasure your comment that Frodo, however melancholy, can't help seeing the beauty of the world around him. He turns away and faces the dawn. I have often thought Frodo's aesthetic perspective, brought out in the book's sequence when the Fellowship enters Lothlorien, was what was "Elvish" about Frodo. Perhaps it is what saved him in the end. However melancholy he became, turning inward, the world around him - its people but also the whole living world - would pull his attention outward and into a spirit of contemplative appreciation. Perhaps it is comparable to Sam, on the plains of Gorgoroth, still having the grace to look up through the gloom and see that star, piercing and and bright, untouched by evil. As if seeing it, this beautiful thing outside himself and his situation, pulled him up there with it. Such sadness and beauty in both the painting and the poem - so poignant. They both just draw me in and don't let me go. As painful as it is to think about what young Frodo went through - it did help to shape him into the best of the Shire. How difficult it must have been - to have the river hold such painful memories but be drawn to it as well. As painful as it is to think about what young Frodo went through - it did help to shape him into the best of the Shire. I am sure you are right, Frolijah Fan. Not to mention, if he hadn't become an orphan he would not have been adopted by Bilbo, who also helped shape him into the best of the Shire. (Not to mention that Frodo wouldn't have been Bilbo's heir, not just of Bag End but of the office of Ring-bearer.) Maybe our own, non-fiction lives are as twined with "destiny" as Frodo's, but we just can't see it. I am seeing this picture and the sad wonder of the taking for this child. The words in this are full of questions and wonder at seeing the beauty of the water, the sky touching colors onto it and the clear reflections. Something that was always loved that has taken what is too precious for him to lose. Words are powerful and these say so much. That is surely true, Verangel. I get pleasure, satisfaction, almost a physical thrill at the sheer art of this piece. The subject of it moves me, of course, and in it 'applicability' (Tolkien's view of it) runs deep. It makes me think and think -- about Frodo and Frodo's story, about my life, about Life. But the words, I come back to the words, the way they are touched to the invisible canvas, like paints. It's art.